The Janeway Children's Hospital is very close to my heart, and I know that it is near and dear to many of you who read this blog as well. 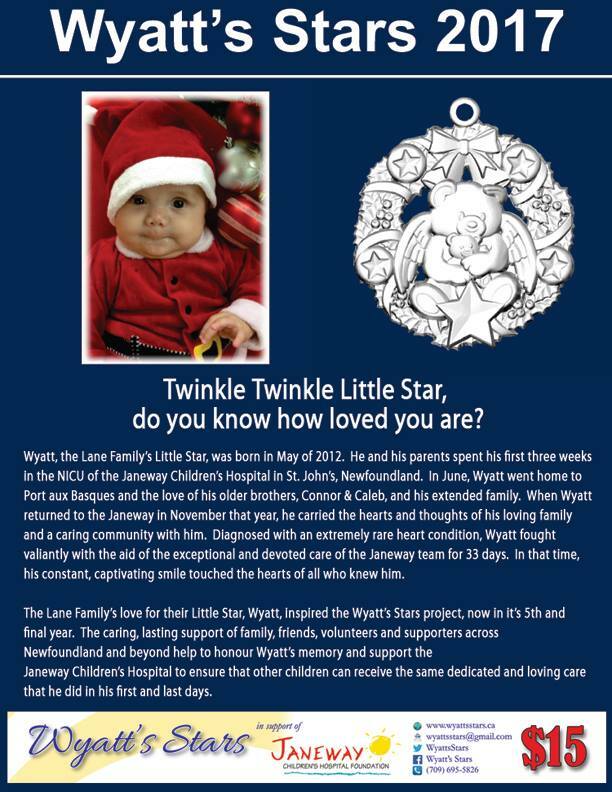 Last year, while doing my Christmas shopping, I discovered Wyatt's Stars ornaments - a fundraiser for the Janeway, and a beautiful memorial to a precious baby boy. I started my collection then, excited to add another meaningful decoration to our tree - a tree that already holds so many beautiful memories. Nestled between layers of wooden beads and strings of white lights are reminders of places and people and magical moments that we never want to forget. I didn't know Wyatt or his family, but I knew that his stars belonged on our tree. Five years sounds like such a long time. When you begin something, when you build a plan that reaches that far, what you’re really doing is taking the first step in a journey with only a dream for a destination. You have a vague idea of where you want to be and a fragile web of thoughts and hopes and maybes that might get you there. What you do not have is any true idea, for all your vision, where the journey will really take you. The by-ways, the sidetracks, the roundabouts, all the million moments between here and there and everything they can contain. As we move into the fifth and final year of the Wyatt’s Stars Project, I feel the undeniable pull of the path we’ve taken and I cannot help but look back, through all that it has been and where it all began. Wyatt James Lane was our Little Star, from the moment he burst into our lives – early, in distress, and in the midst of an already turbulent time of grief and change in our family. His arrival was a flurry of cold, bright fear, desperate, furious, frenetic activity and an inconceivable blending of heartache and hope, despair and determination. He was a fighter from the start. We could do little but sit by and watch as he struggled, survived and conquered. We brought him home, amidst even more family grief and turmoil. He was our bright spot, silver and shining and hopeful, the Little Star of our unimaginable confluence of dark and scary stories. He was our happy ending. Or so we believed, I believed. It was not to be. We spent two months in blissful ignorance, trying to accept - to come to terms - with all that had happened, to learn to heal. We spent another 2 months in willful denial – me more than anyone else – before Wyatt ended up at the Janeway Children’s Hospital in St. John’s again. His home for the first three weeks of his life once again became his home. Again, we found ourselves sitting by, in that same twilight of powerless uncertainty, able to do nothing but watch as he fought for his life under the dedicated, devoted care of his expert medical team. It is strange to use the word brave for one so little, so young, but it is one of the words that everyone had for Wyatt. Throughout all his struggles, his bright, ever-present smile captivated and buoyed the hearts of everyone who met him. His medical team, hospital staff, volunteers and visitors all commented on his strength, his joyous perseverance and the hope they had for him. It was a hope we all shared but Wyatt, our Little Star, was sicker than anyone knew. On December 17th 2012, a week before Christmas, after 33 days at the Janeway, he passed away. He was six months old. Our Little Star’s light had burned out, our happy ending gone. Our family, near and far, was shattered, and our community mourned with us, as did his Janeway team. For such a little boy, in such a short time, he had touched many lives and found a home in many hearts. The days, weeks and months following were a blur of grief-stricken survival. Putting one foot in front of the other, doing the bare minimum needed to get by, to get our older twin boys through, to figure out what life was supposed to be now. In June of 2013, Yvonne and I were watching the Janeway Telethon. It was an emotional experience. The Janeway would always be a part of us from now on, and the Telethon had a very special association for us. Wyatt’s first days at the Janeway had been during the running of the 2012 Telethon, when it had still been held at the hospital itself. It was running when Yvonne first arrived from Corner Brook after Wyatt had been air lifted to St. John’s. During her first visit to see him, we passed through the backstage area to get to the elevator that would take us to the Neonatal Intensive Care Unit. We sat and we watched. We saw children and families going through ordeals like we, ourselves, had. We saw people celebrate the wonders that the Janeway had worked, and others return to remember those children that they had lost. We felt for all of them and we felt our own loss even more. Wyatt had been with us for such a short time. The pain of his absence was unbearable and it was matched by the rapid-growing fear that, outside our immediate family, he would be forgotten. We needed something. A way to remember him, to help others remember that he was here. He was ours and he was real and he made an immeasurable impact on our lives. We needed something to do with all that love and energy that was supposed to be his. It was then that we decided that we had to do something. A project of some sort for the Janeway. An effort, in honour and memory of Wyatt, that could help other children receive the same excellence in care, the same gentle thoughtfulness and compassion that he did. That other families could be afforded the same hope we had, and maybe, just maybe, a better outcome. That’s where it all started. That spark was all we needed. The idea came together quickly, from his story, our circumstances and one of our own traditions. Every year, Yvonne and I bought a special ornament for our Christmas tree and marked it with the year. It was always something significant for us for that year, with elements, shapes and symbols that meant something to us. Wyatt – our Little Star – had passed so close to Christmas that the choice was clear. A Christmas ornament that included stars and other components that spoke to his story. Something that could be a fundraiser for the Janeway and a tangible memorial to Wyatt. From there, the Wyatt’s Stars project was born. Not a one time effort – our grief, our love, needed more than that. We settled on a 5-year project. A plan for a series of five ornaments, all based around the same elements, but growing and changing each year, just as Wyatt would have done. - Teddy Bears: A source of comfort for children and a symbol closely associated with the Janeway. - Angel Wings: A memorial to our angel children who could not stay with us longer and a tribute to the medical angels – doctors, nurses and medical teams – who work with such tireless compassion to care for our sick children. - Stars: Wyatt was our Little Star, and stars represent hope and guidance – both for medical teams and families, when children are sick. Stars are also associated with Christmas, so close to when he passed. Each year the ornament would also feature an additional star, one for his age at each year of the project. - The project name and year would be featured on each ornament, meaning his name would carry on. With the elements chosen, we began working on the designs and looking for a material and means of production. With Yvonne and I working together, the designs came together quickly. For production, we turned to our own past again. For our wedding, we had obtained a number of pewter pieces – glassware with emblems, jewelry, etc. – and the workmanship was exquisite. Pewter was durable and beautiful, and we’d heard of series of pewter ornaments being commissioned. We researched the company that our pewter items had come from – Aitken’s Pewter – and the final piece of the project fell into place. Aitken’s Pewter was a family-owned and operated company in Atlantic Canada – New Brunswick – and right there, on their website, was a brochure detailing a fundraising program they offered. We reached out to them and were contacted by the company owner, Martin Aitken. From those initial calls, through the design rendering process, packaging, production and all the other details – big and small – the Wyatt’s Stars pewter ornament series came to life. In those early days, we couldn’t possibly have known where the project would take us. How successful the project would be, all of the people we would meet, the volunteers, the supporters, the personal and heartfelt stories from people with their own connections to the Janeway or who were touched by his story. With the final year of the project upon us, it is almost unbelievable that we have come this far. That the years have slipped by so quickly and so much has happened. We’ve raised over $30,000 for the Janeway Cardiology department, and we’re hoping for a very successful final year. We’ve received so much support and met so many people, friends and acquaintances that will stay with us long years after the project has ended. Wyatt’s name, and the project, will be featured on a new Wall of Miracles at the Janeway recognizing lifetime donations over $25,000. His name and thousands of stars in his memory hang on Christmas trees every year, including our own, and even in windows, cars and other places throughout the whole year. It is humbling, heart wrenching and comforting, all at the same time, to know that long after the project itself has ended, Wyatt’s story and a legacy of hope and help for others in his name will continue on. This is such a wonderful project, and a beautiful tribute to your son, Wyatt. Yvonne and Jimmy, you are to be commended for your dedication to the Janeway, and for raising much-needed funds for the Pediatric Cardiology department. Your son will never be forgotten, for he lives on in the hearts of many. Supplies of the final ornament in the series are limited, so please be sure to get yours! Email wyattsstars@gmail.com to arrange for mail order. Wyatt's Stars will be available at the North Pole Christmas Fair at the Jack Byrne Arena from December 1-3. 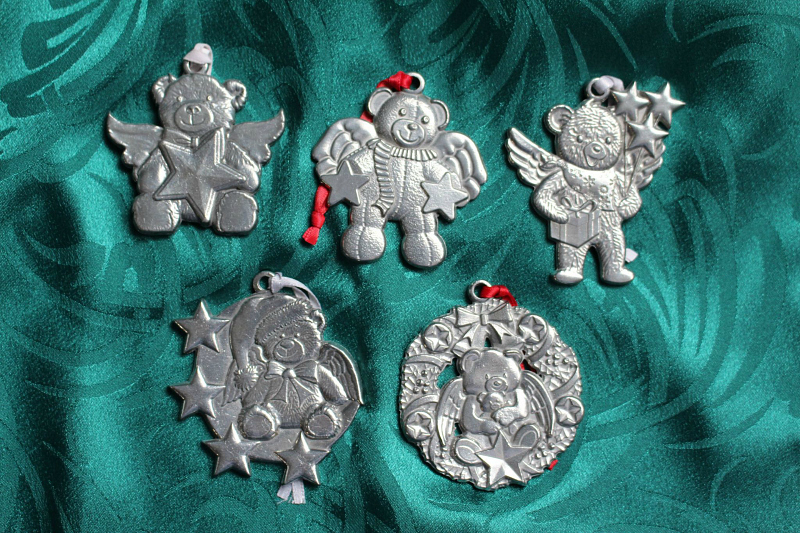 They will also have a small number of previous years ornaments, if you are looking to complete the set! All proceeds go to the Janeway.